Last week, Saturday Night Live's Pete Davidson sparked controversy after a poorly made joke targeted decorated war veteran and GOP congressional candidate Dan Crenshaw's appearance. This week on the comedy show, newly elected GOP congressman Dan Crewnshaw made a guest appearance and proved that he can not only handle a joke, but can dish the smack talk right back while teaching America lessons we all need to hear. 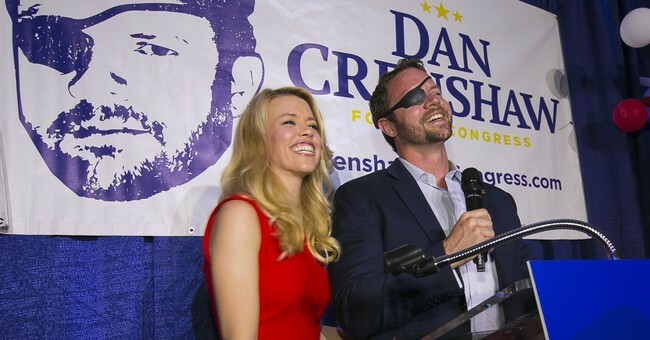 As we reported last week, Davidson made an ugly joke targeting GOP congressional candidate and former Navy SEAL Dan Crenshaw since he wears an eye-patch due to losing his right eye during an IED blast while serving in Afghanistan. On last night's episode, Davidson not only apologized for the joke but even allowed Crenshaw to "even it out" by giving him a chance to say a joke of his own. “In what I’m sure was a huge shock to people who know me, I made a poor choice last week,” Davidson said. “I made a joke about lieutenant commander Dan Crenshaw, and on behalf of the show and myself, I apologize.” The man is a war hero and he deserves all of the respect in the world. And if any good came of this, maybe it was that for one day the left and the right finally came together to agree on something — that I’m a d*ck." Crenshaw then slid next to him and said, "Ya think?" While accepting Davidson's apology, Crenshaw's ringtone went off featuring a song played by Davidson's former fiance, Arianna Grande. The two recently ended things in a high profile break up. Dan Crenshaw appeared on SNL where he accepted an apology from Pete Davidson over his remarks from last week. Crenshaw then was able to poke fun at Davidson's appearance.
" There’s a lot of lessons to learn here,’ Not just that the left and right can agree on some things, but also this – Americans can forgive one another.We can remember what brings us together as a country and still see the good in each other.It’s a good time for every American to connect with a veteran. Maybe thanks for your service,' but I would encourage you to say something else: 'Never forget'. When you say 'never forget' to a veteran, you are implying that as an American, you are in it with them, not separated by some imaginary barrier between civilians and veterans, but connected together as grateful fellow Americans. Never forget the sacrifices made by veterans past and present. And never forget those we lost on 9/11, heroes like Pete’s father.So I’ll just say: 'Pete, never forget'." The full segment can be viewed here be viewed here and is well worth the watch.